This is the second in the series of Mission to Mars resources for use in a space themed set of lessons. A more detailed description of how I use this resource and the thinking behind its creation can be found at the supporting site teacherledplus. This is another IWB resource to allow you to easily build in a thinking skills aspect to your lessons. This resource encourages children to display persistence and develop their thinking strategies as well as record progress. 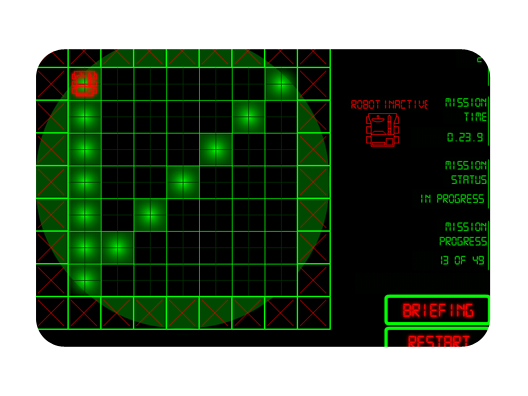 The mission is detailed on the opening screen of the resource. In essence the challenge is to visit each of the squares in the grid with the mars rover in 12 moves (the absolute minimum). Restrictions are enforced in that the rover can only turn in multiples of 45 degrees. Tap a square that you want the mars rover to move to. If it is a valid square it will move if not it won’t. You can click on already visited squares. Every square the mars rover explores by moving through will be illuminated. If you illuminate all squares and return to the start using no more than 12 waypoints the challenge is completed with 100% efficiency. This is possible but will usually require a lot of effort to achieve. Doing it in 13 is not too difficult and their are a number of ways of doing that but 12 is a great challenge. Ideas for making this more achievable for all children are given on the supporting site mentioned above. Restart will clear the current progress. Briefing will show the mission constraints. Get more ideas about this resource at teacherledplus. Go to the the IWB resource. If you need the solution please ask in the comments. It will not be sent for a couple of days to avoid homework cheating. If you use what is clearly a staff email address I will try to send it quicker but cannot guarantee this. I am a year 6/7 teacher in Australia and my kids have done it in 13, but I would love the answer for 12 moves. My class have eventually worked out 13 but we are struggling for 12. Can we have the solution please? Could I please get the solution? Hi I’m a Year 6/7 teacher in Australia and my kids can’t get past 13. Can you send me the solution please?